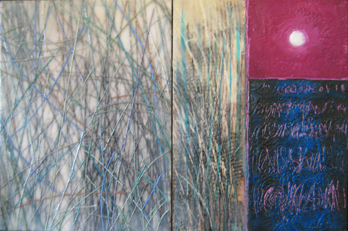 The tandem exhibitions are the first of their kind featuring collaborative work in encaustic media created by member artists paired from each organization. Each artist in the 36 pairings created one half of a two-panel painting or “diptych” then sent the work to the partner artist to answer in visual dialogue and complete the piece. Works completed by IEA artists will debut at the Brian Marki Fine Art in Oregon, and works completed by NEW artists will be introduced at Whitney Art Works in Maine. Selected works of the project will tour nationally throughout 2008 - 2009 with upcoming 2008 exhibitions confirmed for Montserrat College (Beverly, MA) in June, Conrad Wilde Gallery (Tucson, AZ) in September and Steamboat Springs Arts Council (Steamboat Springs, CO) in November. 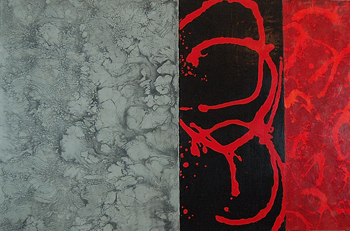 West coast based IEA and East coast based NEW are both professional artists associations that share in similar missions to further excellence in encaustic art. Encaustic is an extremely durable and versatile medium containing beeswax and tree sap then applied to a rigid support with heat to create exquisite visual effects. The medium has been experiencing a rediscovery by contemporary artists, although dating to the 5th century BC, only since the mid-20th century has it been explored and developed as a modern fine art medium. Artists credited with early uses of wax include Arthur Dove, Diego Rivera and Karl Zerbe – and in 1954 when Jasper Johns applied wax and pigment onto canvas, a true encaustic paint. 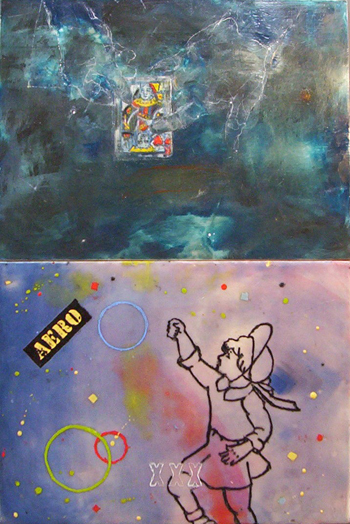 For more information and a complete list of participating artists, please visit The Diptych Project Google Page.